Major League Baseball and Susan G. Komen for the Cure, the world’s largest breast cancer organization, have teamed up to launch the 2010 Honorary Bat Girl contest. 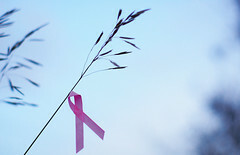 The contest was created to recognize the women who have fought hard to battle breast cancer. For the next six weeks, women are encouraged to share their inspirational stories. Men and women over the age of 18 will be able to read these stories and vote for who they think should be this year’s Honorary Bat Girl. The woman chosen will receive two tickets to the Nationals game vs. the Florida Marlins on Mother’s Day (Sunday, May 9) where they will take part in the pre-game activities which include being honored with a pink ribbon during an on-field ceremony. All testimonials must be entered online and can be submitted by breast cancer survivors or advocates of the cause. The contest ends April 13.